It is reported SPHHD is currently taken the high ground at #12 in Canada, and at #24 in the United States of the Americas. This is an unprecedented event with a most peculiar origin. It is secondarily reported by anonymous sources close to the planners of this misfit event that the mission has its origins in a honest bet encouraged by several too many glasses of absinthe. Both originating parties to the bet, a certain Ms. N____, a sophisticated lady of import in academic circles, highly renowned in literary and crafts fields, posited to a certain Mr. M____, a rather suspect gentleman (the label affixed rather loosely to the subject of said description) that it would be impossible to make a stone a seed, that is, make a success of this most uncertain gaming technology known to be so casual (and unknown) in nature. Not one to be outdone by circumstance (and rumoured to be inspired by fancy of Ms. N____), Mr. M___ accepted the bet as a lark and thereafter removed all pricing from his prize SPHHD device. 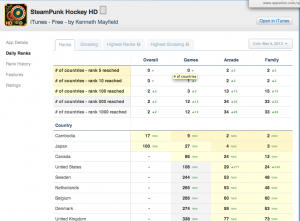 Presently then we find ourselves caught up in momentous events with SteamPunk Hockey HD storming the iTunes Free charts of the Americas. More news later as received by this office to be given immediate relay to you, the gentle reader. Update: new telegraph states, SPH-HD has entered the Top 10 at #9 in the North Americas of Canada and United States Free/Games/Family shelves. Sources close to Mr. M___ state that all is proceeding according to exact absence of plan.